Were your A-Level results better than you expected? If you’ve met and exceeded the conditions of your conditional firm choice, you can try to find another place, without losing your original offer. This process is called Adjustment. UCAS Adjustment is less well known than UCAS Clearing. Unlike Clearing that helps students whose exam results were not as good as they expected to secure a place at a university, Adjustment by contrast accommodates students who exceed their predicated grades by offering them an opportunity to reconsider their choice of course or university. Can I use UCAS Adjustment? Everyone whose university place has been confirmed can register for Adjustment, but you are only eligible to use it if you have met and exceeded the conditions of your original conditional firm choice, that is your first choice (if you have only met the conditions of your insurance choices and not your first choice, you cannot use Adjustment). Adjustment is optional, so think carefully before you change all your plans. Talk to your advisors and consider other factors, such as accommodation and student finance, which might be difficult to arrange at short notice. When can I start using Adjustment? Adjustment is open from A Level results day (17th August 2017) until 31st August. Your personal Adjustment period starts the moment your conditional firm choice changes to unconditional firm. By registering for Adjustment on your Track choices page, other universities can view your application. From that moment, you have up to five calendar days to research and secure an alternative course. The Track page shows how much time is left of your own Adjustment period. Please note that there are no vacancy lists for Adjustment, so you will have to contact universities or colleges directly. Check universities’ and colleges’ websites and phone them to see if they will consider you. You will need to give them your Personal UCAS ID and you should tell them straight away that you are applying through Adjustment. Then they will check whether you’re eligible. If you obtain an Adjustment place, it means you must give up your original offer. The new university or college will inform UCAS. UCAS will then subsequently update your application and send you an email to notify you that something has changed and you should check Track. In Track, you will be able to view and print your acceptance letter. 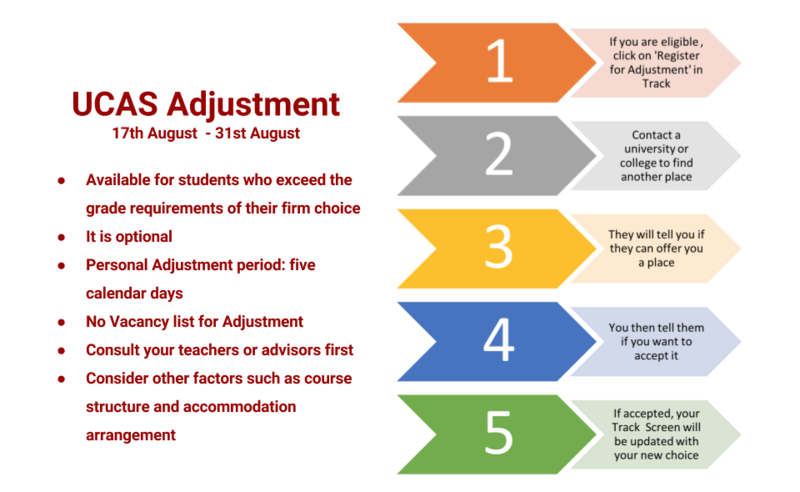 If you register for Adjustment but do not find an alternative place, you will still be able to take up your place in your original first choice. What should I do if I have registered for Adjustment accidentally? Don’t worry if you’ve accidentally registered for Adjustment. Your first choice place won’t be affected unless you contact other universities to apply through Adjustment. After the five-day period has finished, the Adjustment information will disappear on Track. I have exceeded the conditions but I am happy with my first choice. What should I do? It is important to not to feel pressured to register for Adjustment if you are unsure. Although attending a seemingly superior university is attractive to many students, courses vary from university to university and you may not be happy with your new choice. Making such a huge decision within 5 days can be stressful and daunting. If your A-Level results were better than you expected but you are not sure whether to register for Adjustment, or if you need any help with your UCAS applications through Adjustment, do not hesitate to contact us at service@ukguardianship.com or +44 (0) 20 8432 0861.